I just learned that my latest print, American Bible Story, has been accepted for inclusion in the Robert Blackburn Printmaking Workshop (RBPMW) 6th Annual International Juried Exhibition in New York City. The November 3 - December 5 exhibition is scheduled to coincide with the IFPDA Print Fair and New York Fine Art Print Week. The exhibit was juried by David Kiehl, Curator of Prints, Whitney Museum of American Art. RBPMW, now part of the Elizabeth Foundation for the Arts, was founded by Robert Blackburn (1920-2003) who was born in Summit, New Jersey, and was known for his work as a printer, a collaborator, and a lithographer. 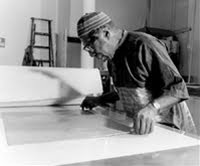 Blackburn worked with some of my favorite artists -- Jasper Johns, Elizabeth Catlett, and Helen Frankenthaler -- in addition to creating his own personal artwork. RBPMW is now a cooperative workshop that also does contract printing and hosts classes and workshops. 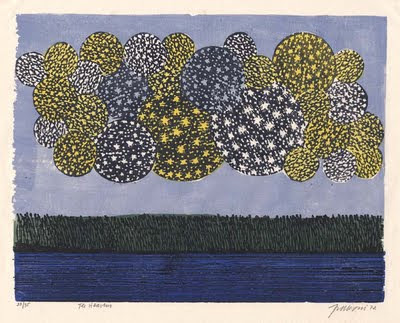 A new show called Creative Dialogues: Latin American Prints & Printmakers at Center for Contemporary Printmaking in Norwalk Connecticut will include 3 pieces by Uruguay born Antonio Frasconi. Norwalk's local newspaper, The Hour, features an interview with Frasconi, who is now 90 years old and has lived in Norwalk for 52 years. There are a number of woodcuts in the show, along with silkscreen and intaglio works, which can be seen in this slideshow. The show runs from today, September 24, through November 07, 2009. This new landscape print will show an evening sky. In that sky will sparkle New World constellations that the English have never seen before. The proper way to do this would have been to do some deep research, to see if I could find actual descriptions of the native Wampanoag people's stories and creation myths about the stars, but I wanted to use my imagination instead. These "constellations" are roughly based on some east coast Indian motifs that I found in a Dover book that I got at the library. I wanted the Indian to be composed of some of the same stars as the European constellation "Orion." This article in Wikipedia about Orion describes how even today different cultures picture the same stars differently. In the Southern Hemisphere, Orion is oriented differently, and the belt and sword are sometimes called the Saucepan, or Pot. Orion's Belt is called Three Kings in South Africa and also in 17th- and 18th-century Dutch star charts. The same three stars are known in Latin America as The Three Marys. Last week my really big (20 x 30 in / 50 x 76 cm) pieces of shina plywood arrived, so I've set aside my carving of the Eliot Bible for later and am starting on the "first" print for this group, called Vast Unpeopled Lands. This savage people ruleth over many lands without title or property; for they enclose no ground, neither have they cattle to maintain it, but remove their dwellings as they have occasion, or as they can prevail against their neighbors. In other words, because the native peoples did not claim private ownership of land, or fence it or live in permanent villages, the English saw the land as unclaimed and ripe for the taking. This print will be a landscape print. Friday Night I set up a temporary studio for a few hours at a storefront venue called Valley Hands and demonstrated woodblock printing during Northampton's monthly Arts Night Out. It was a rollicking evening, and a few brave souls even ventured to try it themselves. Here are some photos from the event. We started at around 4:00, and one of my first visitors was a young girl and her mother who quickly got the basic principles figured out. There were a lot of old friends meeting up and new connections being made. Very festive. My friend Jane was very enthusiastic about trying it out herself. I held the paper for her while she got a feel for the baren. Jane and Joan were thrilled to find out how easy it is to make a print! Artist Colleen Blackard was also making art there. She makes universes with a simple ballpoint pen. And Katie Richardson works with glass. Molly's sunglasses came in handy for watching Katie work with the torch. What a ridiculous amount of work to carve all these letters just to make a few prints that look like John Eliot's Bible. Why not use a photographic process like screen print or solarplate and get on with it? I guess it's because I want to "own" the work, I want to make it mine. I want to experience in some small way the hardship that John Eliot endured to make this translation of the Bible into the native language. Philosopher John Locke talked about this transformative power of work in the late 17th century when he put forward his labor theory of property. Simply stated the theory says that when a person works, their labor enters into the object and so the object becomes their property. I'm not sure about the property part of the argument, but I do have the experience that when I work on a woodblock print my labor enters into the artwork. This is a sensation I've always enjoyed and valued. When I was a child, I used to love to copy artwork or photographs that pleased me. As I became a young adult, I vowed to purchase only items whose origin I could identify, a vow I of course couldn't keep, but that I hold as a kind of touchstone still when I evaluate the value of an object. There are other artists who seem to feel this same way about deeply laboring. I recently became aware (via curator Elizabeth Schlatter) of an artist named Molly Springfield whose project Drawings of Photocopies of Books seems to embody this same spirit of obsessively recreating texts. In her project, completed over three years, Springfield meticulously recreates xeroxed texts in graphite, including all of the strange shadows and lines and artifacts of the xerox process itself. A woman after my own heart. The question is, does that labor -- the hundreds of hours, the thoughts and feelings experienced while working, the music the artist listened to -- does any of that actually get communicated by the work? Can a viewer perceive it? The rational answer is no. But my heart says yes. My heart says that it matters what I'm doing when I'm making art, what I'm thinking, what I'm feeling, and that that "investment" in the work is perceivable. The text I'm carving is about the equivalent of 17 point Times Roman. I've worked out a three-stage carving process which you can see in the photo above. First I carve out all the "holes" -- the spaces in the letters o, d, g, etc. You can see this at the bottom of the photo. Then I use a very sharp straight knife, called a toh, to outline the letters (seen in the middle portion of the photo). And finally, I use the same knife plus a small u-gouge to clear away the wood around the letters, as at the top of the photo. Naturally this is taking much longer than I expected, which I should have expected. The Puritans placed great importance on education and literacy, as Puritan individuals were obligated to read and interpret the Bible for themselves. This was as much a political as a religious stance, since literacy broke down the exclusive authority of the popes and priests of the Anglican and Catholic churches. 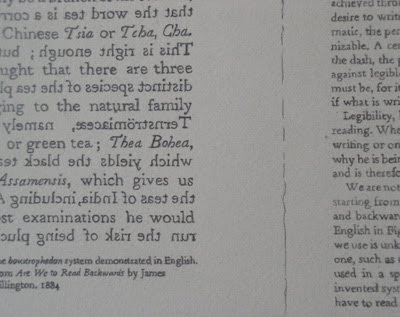 John Eliot's Indian Bible falls within this tradition of making the scriptures available to the common person, and it was the first time the Bible was translated for the purpose of evangelization. English Puritan Richard Baxter once stated that it was "impossible to mention the name of John Eliot apart from the word love." Surely the ten-year process of translating the Bible into Algonquin was a labor of love, and no doubt Eliot grew to love the Wampanoag people with whom he spent so much of his time. But even love has unintended consequences. Even though Eliot respected the Wampanoag people so much that he labored to convey the gospel to them in their own tongue, it was impossible for Eliot to convey the gospel without conveying English-ness and without denigrating Indian-ness. The spiritual conversion of the so-called "Praying Indians" of Massachusetts required the converted to cut their hair and dress in English style clothing. In addition, Eliot brought his converts into "Praying Towns" and set up a Bible-based structure by which the Indians could "govern themselves" under his guidance. In other words, conversion to Christianity required separation from Wampanoag cultural heritage and submission to the Anglo culture. Most any evangelizer will tell you that his/her motivation is love -- love for God and/or love for the object of his/her evangelistic fervor. A couple of years ago I was on the receiving end of a fervent mission on the streets of Northampton. It was a beautiful sunny Saturday morning and I was waiting outside while Lynn was at the bank. I hardly noticed the small group of people coming toward me on the busy street until a middle-aged woman thrust a flyer at me and said "Jesus loves you." I smiled and said, "no thanks." Suddenly it was her face she was thrusting at me, and she practically spit at me as she said, "You hate God, don't you?!" I was too stunned to say anything, but as I watched her walk away I became furious -- furious that this woman who had absolutely no idea who I am or the nature of my relationship with God felt entitled to speak to me that way. Did she think she was acting out of love? My experience as the evangelized was that she was acting out of contempt. This is an extreme example, but I suspect that in some measure both love and contempt are always present in the exchange between the evangelist and the evangelized. As I've worked on this series of prints about the Pilgrims, I've been pretty compulsive about creating them in chronological order. The "next" print, if I were to do these in order, would be Vast Unpeopled Lands but I can't start that print for at least a week until my large pieces of shina plywood arrive. So I'm stepping out of order and starting work this week on a print with the working title "The First Book." It's a print about the Massachusett Indians, a missionary named John Eliot, and the first Bible printed in America. John Eliot was born in England in 1604 and came to Boston in 1631. Eliot was a fervent missionary who set his sights on the conversion of the Massachusett Indians. To help achieve this, Eliot dedicated himself to translating the Bible into the Algonquian language. At that time, Algonquin was considered to be one of the most difficult languages in the world. For ten years, sometimes spending 4 or 5 days in a row with the natives, Eliot worked with the assistance of John Sassamon, a member of a local tribe, whose ability to speak and write English proved invaluable. In 1659 the task of translating the Scriptures was completed, and the printing was completed in 1663.